After doing endurance runs this long, I know that I usually get the race I’ve trained for. Sometimes that’s good. But lately, my training’s been spotty. In fact, the last run over about 15 miles had been the marathon on Taylor Mountain back in June. I’ve been running lower than I should on sleep, and my daily runs have felt a bit sluggish too. 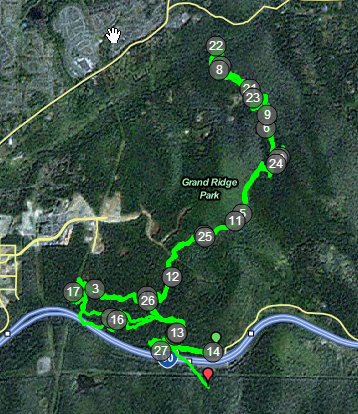 So when I lined up for Grand Ridge, I didn’t really think it was going to be one of my better marathons. I was right. Race morning was overcast, and cooler than it’s been. We’d had our first rain in over a month the day before too, so it wasn’t a surprise that it felt a bit humid. I lined up for the start with the other 60 or so people doing the marathon and 50k, and tried to stay loose, as they counted down and sent us off. The course starts with a couple of climbs, followed by that nice downhill. Then we continue on mostly level ground for a while before turning around and coming back. I was wise enough to take it easy on the uphills, walking a bit when they got long or steep. The real trouble started around mile 5, when we began a long downhill. I knew at the time I was taking it too fast. I could even feel my quads telling me the same thing. Still I managed to ignore all of this good common sense. By taking those downhills so fast, I also managed to aggravate some nerve compression in my left foot. It’s been an issue for several years, and I will usually keep a lower footstrike to mitigate it. Not today though – and this would hurt quite a bit in the middle and late miles. I completed the first half in just over 2:30. It was clear that a sub five hour day was not very likely. I was unhappy with how I felt – almost like it wasn’t fun. I fought the urge to think about what I’d do when I finished – once you do that, it’s a constant game of looking at your watch and thinking “are we there yet?”. The whole time I’m aware that the problem is the attitude and the preparation I’ve brought to the starting line. The trail is really nice, the weather’s fine (if a bit humid), and the event’s well-organized (as the Evergreen Trail Runs usually are). I’m in a rut – and need to change the way I’m thinking about my running. The second time out, I looped the finale song from Les Miserables in my head over and over. My daughter had appeared in this the weekend before – and I’d been struck by it’s power. As Jean Valjean ascends to heaven, the full ensemble enters, singing – softly at first, then building in volume and harmony. The sound is wonderful – but really has nothing to do with running a marathon on a trail while my legs are hurting. Perhaps it was that most of the bloodflow going to my legs (rather than my brain), I couldn’t conjure up a metaphor relating the my current predicament to the June Rebellion of 1832. But the song was catchy – the same 30 second bit played over and over. For two hours. I felt better when I made it to the final aid station stop with just under three miles to go. I knew the majority of the remainder was downhill, and wanted to muster a good effort to salvage just a bit of pride. When I crossed the finish, I walked a bit and thought about things. The last time I’d run this course, it had been November. I was clicking off my sixth 50k and eleventh event of the year. My goals and motivation had been much more clear. I think I’ll need to mull what the next big goal should be. 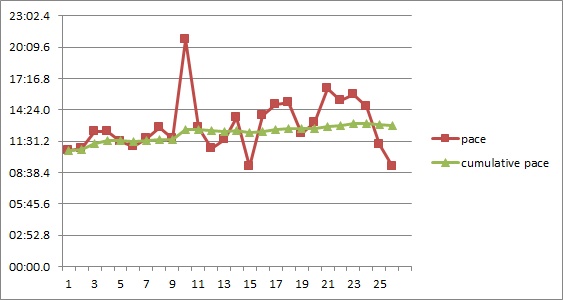 So – the chart doesn’t clearly show it, but my positive split for the second half was about 15 minutes. You’d think I knew better, wouldn’t you?